You think you’re cool? Well, this lady from Minneapolis is about to rob you of all your cool points. 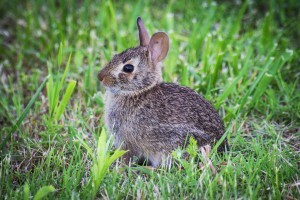 While on her way to a party, biking on one of Minnneapolis’ main bike trails, she struck a rabbit. She field dressed it (while wearing a party dress), went to the party, took the rabbit home and butchered it. Read all about it here. I wonder how well things would turn out if I hit something on the bike trail here in Florida. She says it was 27 degrees, so it was cool enough to leave the rabbit outside, on her bike, while she attended the party. If I were to hit an animal with my bike and field dress it, I probably would not be able to leave the thing outside — there’s no natural refrigeration in Jacksonville. I would have two options: a) skip the party and get animal to my house ASAP or b) ask my buddy if I can put a field-dressed rabbit in his freezer. I think I would have to go with option b, just to see the look on his face. A few months back, I posted about animals one encounters on bike trails, and some of you responded with great comments about the animals you see on Florida bike trails. Now I want to know if any of you have ever killed and eaten an animal you hit while biking. Did you field dress it on the side of the trail? Did you butcher it at home? Did you come up with a great recipe? Seriously, if anyone has a really good recipe for armadillo, I want to know what it is! I hit a dog once but the dog survived so I was not able to field dress it. It was a small dog anyway and ran right out in front of me and I couldn’t stop in time. The poor thing went running off yelping bless it’s heart. So I have no idea where it went off too and I have always wondered if it made it okay. Anyway I almost hit a couple of rabbits on my 100 mile trek to see my parents last month but they were too fast and got away of course I was fully loaded and only doing 12 – 14 mph and I had just eaten. Since I didn’t have a way to store them I would have had to stop and eat them right away.